Pictured above: A fleet of long-range autonomous underwater vehicles, some carrying Environmental Sample Processors, is prepared for their important role in the MBON project. Life in the sea is complex and varied, ranging in size from organisms that we can only see with our most powerful microscopes to the largest known animal to ever inhabit our planet, the blue whale. Our marine ecosystems play an important role in planetary health by supplying more than half of the world’s oxygen, exchanging carbon and other elements with the atmosphere, supporting a diverse food web that includes humans, and playing a central role in regulating climate. However, observing the complex and varied diversity of life in the sea is exceedingly difficult given that the majority of the ocean is deep, vast, and perpetually dark. As a result, we have incomplete knowledge of the number of species that inhabit the sea, their abundance, distribution, and variability over time in response to changing environmental conditions. This poses a fundamental question: How can we preserve the mindboggling diversity of species in the ocean before we even know that they exist? Understanding how marine life is responding to changes, both natural and human-caused, in the ocean requires that we first create a baseline of which species live where and in what abundance. New techniques and autonomous tools are making it possible to learn about the biodiversity of life in the ocean and informing how best to manage ocean resources. To make matters worse, life in the sea is currently threatened by a myriad of internal and external forces, including global warming, an increasingly acidic ocean, the loss of oxygen, pollution (e.g. carbon dioxide, fertilizer, plastics, heavy metals), and over-harvest of living marine resources. A first step to understanding how these forces are driving changes in life in the sea is to establish a biodiversity baseline—a record of which species currently inhabit an area. To meet this need, a group of national and international entities have organized a Marine Biodiversity Observation Network (MBON) program to help establish standardized methods for assessing life in the sea at regional to global scales. This program builds on the very successful Census of Marine Life that included a global-scale top predator tagging effort. Within the MBON program, MBARI is working with partner institutions to advance the collection and technology for assessing biodiversity. Furthermore, MBARI is uniquely positioned to support the development of baselines of life in the sea, to determine how and why marine life is changing over space and time, and eventually to provide options for mitigating potential harmful impacts of climate change. MBARI’s role in the MBON project is focused on assessing pelagic (open-ocean) biodiversity within the Monterey Bay National Marine Sanctuary. Scientist Francisco Chavez is the lead of MBARI’s MBON effort. Additional partners include the Central and Northern California Ocean Observing System, the Center for Ocean Solutions, NOAA Southwest Fisheries Science Center, Stanford University, and the University of South Florida. The project aims to integrate biodiversity information from existing programs and develop advanced and innovative methods for conducting biodiversity assessments. The team also will provide a socio-economic context to biodiversity information. Postdoctoral Fellow Kathleen PItz explains the tools used to understand marine biodiversity. The project has improved communication among scientists and managers in the central California region. For example, MBARI maintains active time-series programs in the Monterey Bay region, which involves the careful collection of biological, chemical, and physical measurements repeatedly in the same locations over decades. MBARI also uses the region as a natural laboratory for technology development. Colleagues at the NOAA Southwest Fisheries Science Center conduct annual fishery stock assessment surveys for rockfish and other commercially relevant species. Collaborations through the MBON project have furthered these efforts by bringing together the science and technology-development teams with the resource managers. Mean sea-surface temperature for the northwest coast of North America with the boundaries of the California Current Large Marine Ecosystem (CCLME, dashed black lines), the Monterey Bay National Marine Sanctuary (solid white lines), and the Monterey Bay Aquarium Research Institute (white dot). The CCLME is characterized by cool, productive waters. The fisheries team carries out basic research on year-to-year changes in biodiversity and provides links with the NOAA Integrated Ecosystem Assessment, an important user of MBON information. An overall focus of MBON is understanding the role of ocean-climate dynamics on biodiversity of pelagic species within the California Current and the marine sanctuary. The specific goal of the Southwest Fisheries Science Center is to determine mechanistic drivers of the abundance of juvenile rockfish, a critical forage species and valuable indicator of ocean health in the sanctuary, to benefit fisheries and ecosystem-based management within the California Current Large Marine Ecosystem as a whole. Core observations include the NOAA fisheries group’s rockfish cruise data, ocean-climate indices, data-assimilative ocean models, and Argo floats. Essential biodiversity variables and time series of pelagic forage species diversity and richness from the rockfish midwater trawl surveys contribute to the development of real-time infographics for the sanctuary. The MBON team is currently evaluating the use of environmental DNA (eDNA) on rockfish surveys and MBARI time series, and carrying out intercomparisons between eDNA measurements and traditional biodiversity collections (see more on eDNA below). The MBON project has also led to a harmonization of regional biological data collection using international standards. Managing and synthesizing biologically disparate types of measurements from different regional programs presents a significant challenge. Biological observations vary greatly in methodology, requiring a standard vocabulary and data management practice to ensure that data can be reasonably interpreted. MBARI and MBON have been implementing a biological diversity data standard called Darwin Core. The standard facilitates the sharing of biological data by providing a set of commonly used terms. Using this standard, data can be submitted to global data repositories like DataOne and the Ocean Biogeographic Information System (OBIS). MBON partner CeNCOOS, with Axiom Data Science and NOAA CoastWatch, has worked with observation programs to make the data publicly available online. These biological data sets, together with ancillary environmental data are exposed to the public through this portal (https://mbon.ioos.us/), where users can run complex analyses and generate custom data products. The MBON project relies on traditional water-sampling methods, left, as well as autonomous collection methods, right. The MBARI long-range autonomous underwater vehicle, equipped with an Environmental Sample Processor, is an important tool in the MBON project because it allows the collection of more water samples at less expense, and over greater distances, than is feasible with traditional ship-based operations. Central to the MBON project has been the incorporation and development of new and innovative means to assess biodiversity. For example, DNA from animals is suspended in seawater, in the form of particles, skin, or excrement. Using a single water sample, this DNA from the environment, known as eDNA, can be used to detect organisms ranging from microbes to zooplankton, fish, and whales. Based on results from the MBON project, and others around the world, there is now a growing consensus that this technique provides a new and exciting window into observing life in the sea in ways that can be more effective than traditional methods. By using autonomous vehicles that can collect samples at the required temporal and spatial scales, scientists hope to use eDNA to revolutionize their ability to develop baselines and time-series abundances of life in the sea. The MBON project has been developing best practices and standards for eDNA analyses, and resolving the myriad of methodological challenges associated with the new techniques. 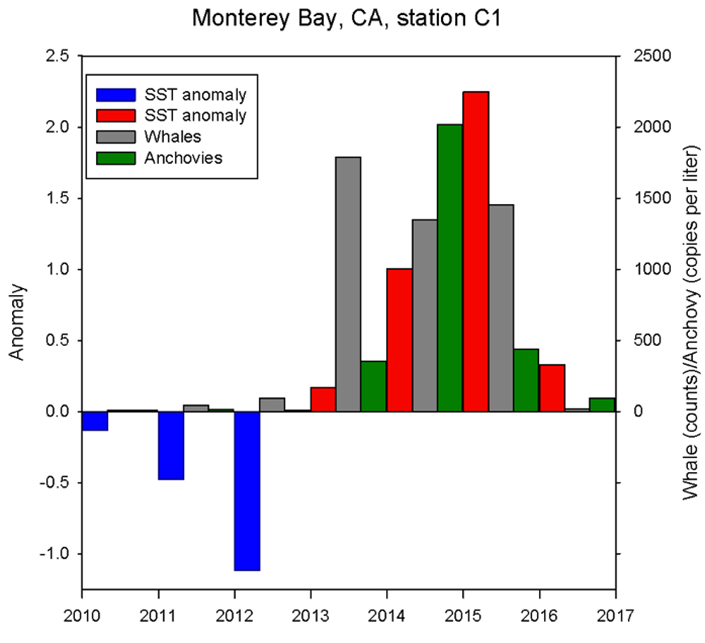 Using these best-practices, the team has been able to reconstruct an eight-year monthly time series of microbes to fish in Monterey Bay. In parallel, scientists and engineers participating in MBARI’s Controlled, Agile, and Novel Observing Network (CANON) Initiative have used fleets of autonomous vehicles to study patchy or ephemeral ecosystem processes in conjunction with the NOAA rockfish assessment cruises, including using the autonomous vehicles to collect eDNA. 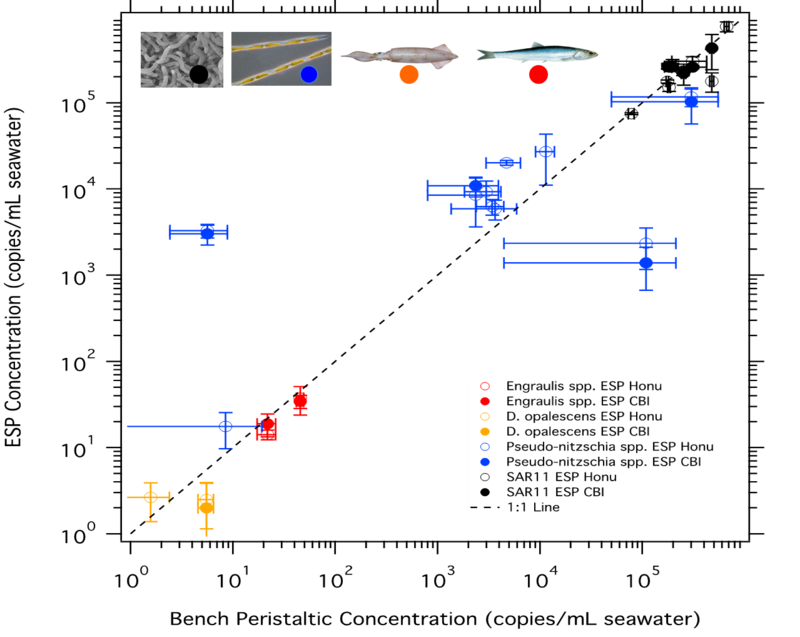 Comparison of anchovy eDNA detection from archived samples, whale-watching boat sightings, and sea-surface-temperature anomaly. An increased presence of anchovies was detected in Monterey Bay, California, during warm water periods, despite previous data that showed cool conditions favor anchovies. Intercomparisons between water samples collected by ships and autonomous vehicles, as well as traditional net samples, are ongoing; encouraging preliminary results indicate that samples acquired using autonomous vehicles are equivalent to those obtained manually from a ship. This points to a future where the needed sample collections can be scaled up dramatically if the strict requirement for ship-based operations can be alleviated. The MBON project has also afforded the opportunity to compare eDNA samples from distinct environments and depths. 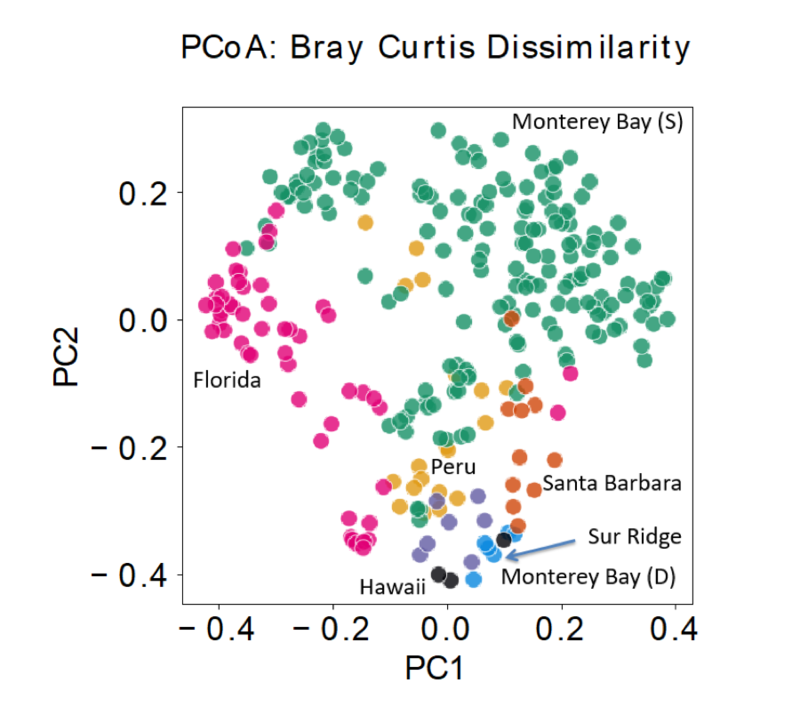 Samples from Peru, Florida, Hawaii, Santa Barbara, and Monterey Bay indicate that depth is an important determinant of marine biodiversity. 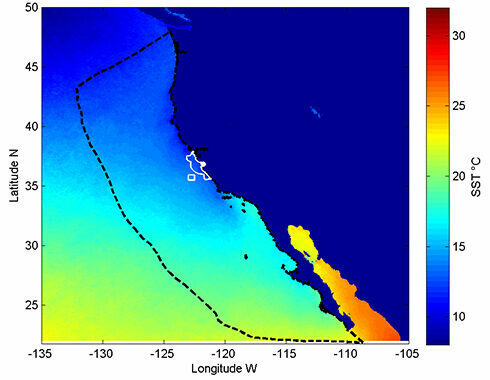 Net-tow samples from a Western Flyer expedition to the Gulf of California were analyzed using MBON protocols, and the resulting patterns are consistent with the California Current circulation and species indicative of tropical waters. The colors in this graph represent different DNA markers detected in water samples from different areas. The MBON project is comparing eDNA data from different regions. It is evident different species are more prevalent in some areas than in others. A significant challenge moving forward is how to build an operational MBON system—one that could operate routinely at local, national, and global scales. This will require autonomous data and sample collection systems, near real-time analysis of material and information gathered, and computer models that correlate physical, biological, and biogeochemical data to yield actionable information needed for effective resource management. 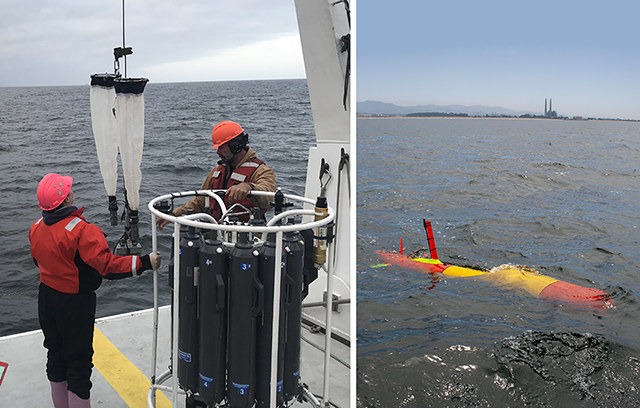 MBARI can play an important role in this regard by developing the autonomous systems needed to collect biological data and samples by using eDNA as well as other observational technologies such as acoustics, optics, animal tagging, video, and satellite remote sensing. Each of these methodologies provides important but different information regarding the distribution, variability and behavior of marine populations. The scientific community is still working on how to combine the outputs from these different measurement techniques to develop integrated views of life in the sea. The autonomous collection of biological information, and its integration and display, will remain an important focus for MBARI into the future. Using machine learning to decipher large data streams from an underwater microphone.